Use action words like "FREE" and "Click Here" in your banners. Offering something "FREE" in your message attracts the reader to click on your banner. Banners with "Click Here" teasers and similar action phrases also increase click-through. A short and punchy banner headline makes a difference. Always load your headline with benefit statements - offer solutions to the challenges that your customers face. If you sell diet products, try "Lose 10 pounds in four weeks!". Work on a winning combination of text and graphics in your banner ad. Animated banners usually outperform their static counterparts by more than 100%. Surfers are more likely to notice banners that are animated. Example: If you have the words "Click Here" flashing in your banner, it will perform better than a static version. Many of us are not graphic artists. We can create simple banners but it is hard to match the work of a professional graphic artist. You should engage a professional banner ad designer to create your banners. Expect to invest $80 per banner. The standard sizes for banner ads are 400x40 pixels or 468x60 pixels. I recommend that you design a 468x60 banner. With the clutter of graphics on most webpages, a larger banner has a higher chance of getting noticed. These banners resemble Windows dialog boxes, scroll bars, submit buttons or blue-colored underlined hyperlinks. They attract you to click on the dialog boxes and scroll bars - which you are already accustomed to doing with the Windows operating system. If you use trick banners with short and punchy headlines, you can get click-throughs above 10.0%! Reduce your banner file size to less than 15k. The last thing a surfer wants is a slow-loading webpage. Most websites and banner exchanges do not allow excessively large banners. Create a fast-loading banner right from the start. Optimize your banner file size through your graphic software or an online graphic optimizer. Always have 2 or more banners to promote each product. A banner usually burns out after a surfer has seen it 3 times. They will ignore (if not hate) banners which they see repeatedly. If your click-through is steadily declining, then it is time to rotate your banners. Place your banners on websites visited by your potential customers. If you promote gourmet coffees, place your banners on sites targeted at gourmet coffee drinkers. The quality of leads generated are higher, and more likely to result in sales. Running your banners on targeted sites generally yield higher click-throughs and return-on-investment (ROI). You are reaching people who are most interested in what you have to offer. Of course, you can try websites with general audience if they generate substantial ROI. Make it a point to check on your banners' performance every few days. Monitor the click-through rate. The click-through tells you how well your banner performs. Most banners fetch a click-through of between 0.8% to 2.0%. If your banner gets more than 2.0%, it is doing a pretty good job. By monitoring your banners' performance, you can kill under-performing banners before they waste away your advertising dollars. Do your mathematics for each banner advertising campaign. Calculate the cost-per-visitor, cost-per-sale and return-on-investment ratios. For example: If a website charges you $20 per thousand impressions ($20/CPM), and you get a 2.0% click-through (20 visitors), your cost-per-visitor is $1.00 ($20 / 20 visitors). And if 1 in every 10 visitors buys your product, your cost-per-sale is $10.00 ($20 / 2 sales). So if each sale of your product produces a gross profit of $15, then your net profit per-sale will be $5.00 ($15 gross profit - $10 cost-per-sale). Your return-on-investment (ROI), before non-marketing expenses, is 50.0% ($10.00 total net profits / $20 investment). This campaign is profitable! Try advertising on different sites or using different banners. Find the winning combination(s) that can yield the highest ROI. Comparing Deal A which yields an ROI of 20% to Deal B that yields 60%, your advertising dollars work three times harder (and profitable) with Deal B! Source: "Chee Wee is a professional internet marketing consultant. 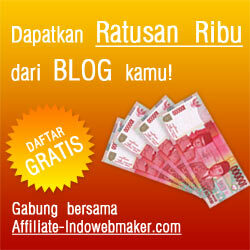 Join his FREE affiliate program and EARN a generous commission of US$50 per sale! Commissions are paid in 7 global currencies with realtime online stats. Accurate tracking with 5-year cookies. Check it out at http://www.internetmarketingfocus.com/affiliate"